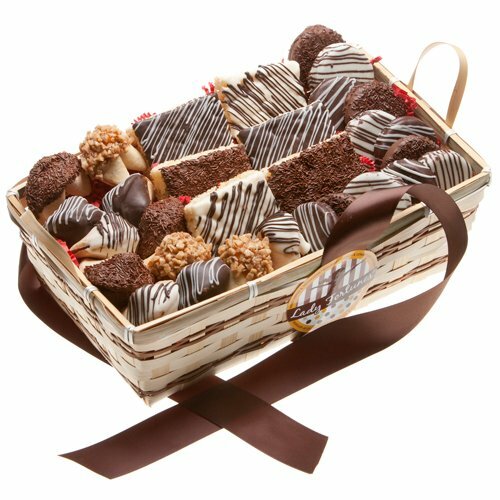 The perfect gift for any time of year, the Classic Style 30 pc Cookie Gift Basket is sure to bring a smile to any celebration. Each Basket contains: -6 Classic 2" x 3" Rice Crispies; -12 Classic Style Oreos; -12 Classic Fortune Cookies filled with Traditional messages of good fortune. Each Basket is finished with a lush bow. The perfect gift for any time of year, the Classic Style 30 pc Cookie Gift Basket is sure to bring a smile to any celebration. Each Basket contains: -6 Classic 2" x 3" Rice Crispies; -12 Classic Style Oreos; -12 Classic Fortune Cookies filled with Traditional messages of good fortune. Each Basket is finished with a lush bow.